A fast-paced game of skill, luck and strategy! 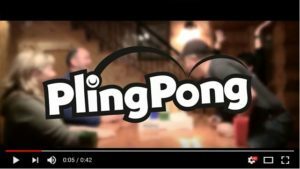 See our new PlingPong promo video! 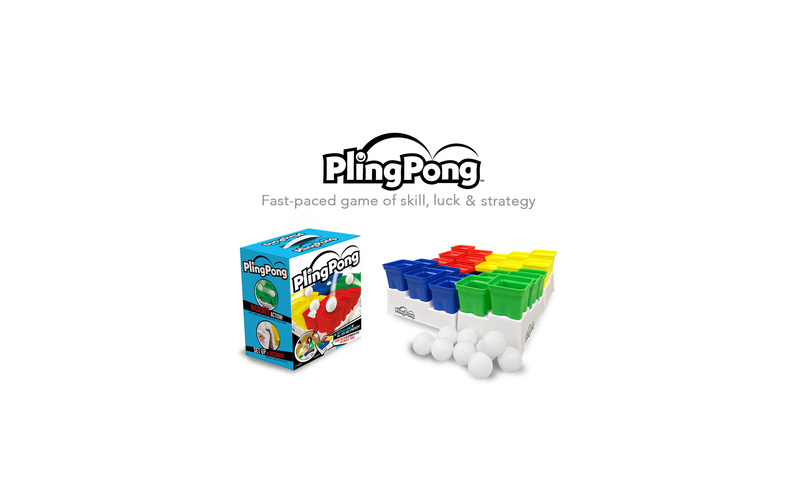 PlingPong is a fast-paced game of skill, luck and strategy! The game comes in an easy carry box and sets up quickly. The 4 interlocking trays create a single game board, which holds the black cup in the middle and four sets of six colored cups on each tray. PlingPong is fun for all ages, it plays fast and in a variety of settings. Play it standing up or sitting down; on any table, counter or bar that you can bounce a ping pong ball on. With the board setup diagonally, players shoot over their color, to hit the other player’s cups. In each round players shoot twice, then score the round; empty cups stay on the board, cups with 1 or 3 balls come off and cups with 2 or 4 stay on. Simply put, even cups stay, odd cups go. PlingPong is simple to play, but the board changes with every round. The goal is to bounce your shots into the opponent’s cups, while avoiding the black cup in the middle. The last player with cups on the board wins! The black cup is the twist in PlingPong, if your ball goes in the black cup, you lose a cup, but the other players gain a cup. Even if you have no cups left, you are still in the game, because you will get back when someone makes a black cup shot. The unique layout of the multilevel board provides lots of ricochet action and funnels errant shots towards the black cup; while the patent pending ball capture design keeps balls from bouncing off the bottom of the cup.